Isobella Jade's Petite Modeling Tips: The Self Investment of Shorter Models and Model Life book giveaway! The Self Investment of Shorter Models and Model Life book giveaway! This week I am sharing insight on Model Talk Radio on the self investment a shorter girl experiences in modeling. The segment is called The Self investment of Shorter Models. I am also shareing the differences of hands-on and DIY investment between commercial print models and fashion models and that height is not everything in the whole landscape of modeling. Don't worry you can also catch the archive anytime. As you most likely know, I am the author of Almost 5'4", my modeling memoir, (I hope you get to check it out, it's in stores, on Bn.com and Amazon) and also I am the author of a graphic novel/comic book called Model Life: The Journey of a Pint-Size Fashion Warrior. Yay! This week I am holding a contest and I am giving away two signed copies of "Model Life: The Journey of a Pint-Size Fashion Warrior", my graphic novel/comic, Illustrated by Jazmin, which I think you will love! 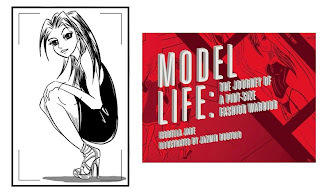 My graphic novel Model Life, is based on my real modeling adventures, only it is a visual, like a comic book, and in the book the character is told she could model handbags, despite being so short. Height isn't everything in modeling if you know how to work what you have and you notice that models can model products where height isn't a factor. Like for accessories. Email me a photo of you modeling a handbag to win a signed copy of Model Life, your photo will be featured on this blog. I hope to catch you for this weeks segment of Model Talk Radio, and for this contest. I am sure you will enjoy Model Life. Some of my favorite pages in Model Life will be featured later today.